Looking for a mouth-watering bite? It may be parked right in front of your nose. Catering to on-the-go foodies looking for a quick and tasty meal, food trucks are shaking up the food industry across North America. But many of these “start-up” restaurants are serving up more than just good food to their customers. Here’s what three of the best food trucks in North America are doing to build relationships and engage with customers on social media. 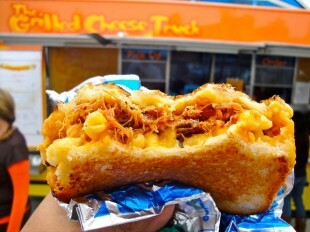 In November 2009, the world’s first grilled cheese truck opened its windows to fans who melted for this savory sensation. Since then, ‘The Grilled Cheese Truck’ has become so popular that CEO, Founder and Chef (aka the big cheese), Dave Danhi has opened 7 trucks across America with plans for further expansion. Embraced both locally and internationally, their melts have landed them “Best Food Truck” over 10 times, “Top 10 Sandwiches in the Country” and countless television appearances. When Dave’s not innovating new melts, he’s managing relationships and telling his brand story on social media. Second to LA Times and LA Weekly, The Grilled Cheese Truck has been listed as the 3rd most influential “Tweeter” in LA for several years. From the most influential food truck in the country on Twitter, to the most followed truck on Facebook, The Grilled Cheese Truck turns to social for more than just truck locations and daily specials. On social, fans give their input on favorite past specials, aid in new menu items and suggest new truck stops and promos. America takes breakfast seriously. 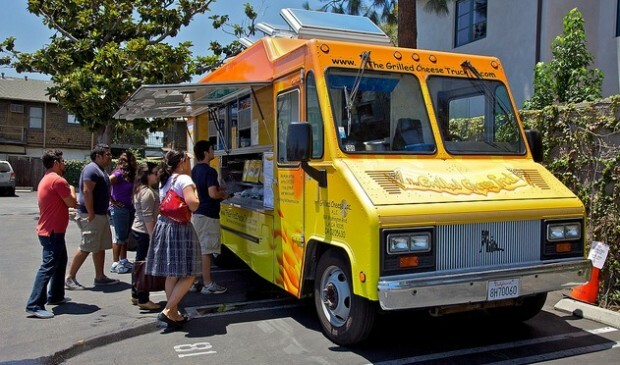 Serving up a buttermilk mix of sweet and savory is one of LA’s most popular food trucks, The Buttermilk Truck. This breakfast-based food truck whips up crowd pleasers with a yummy twist. Like applewood smoked bacon, egg and cheddar cheese wedged between two buttermilk biscuits made to order – even for a late-night snack. Their patented Red Velvet Pancake Mix makes for best selling pancakes that Buttermilk fans can even make at home. As the name would suggest, Caplansky’s Food Truck serves up old school Jewish soul food to Torontonians on-the-go. The truck, lovingly named “Thunderin’ Thelma” has been around since July 2011 and was one of Toronto’s first wave of Food Trucks. Traveling across the Greater Toronto Area (Canada) for lunch, dinner, late night street eats and events, these trailblazers are known for their smoked deli meats, pickles, poutine and Canadiana favorite – maple bacon donuts. Closely tied to the famous Caplansky’s Delicatessen – as in the food all comes from the same kitchen – both their deli and Thunderin’ Thelma turn to social to connect with loyal fans. Not only does the truck rely heavily on Twitter and Facebook to let followers know where the truck is, but they also use it to build buzz. “We’ve definitely seen a positive correlation between creating social media buzz around the truck and getting more followers and even actual sales from new customers,” says Elizabeth Callahan (aka Ellie), Caplansky Food Truck Manager. “HootSuite has really helped us organize our social media. The ability to pre-write many of our posts, has allowed us to create a consistent ‘voice’ for our tweets and to properly plan out a strategy. Before HootSuite, tweeting always felt very last minute and ‘bare bones.’ Now, the social media management aspect of my job is much more enjoyable, especially after learning from other users on ways to use the platform more effectively” – Elizabeth Callahan, Caplansky Food Truck Manager. When your business and clientele are always on-the-go, a powerful social relationship tool helps manage and schedule your social customer service and marketing ahead of time.